(21880.2, Oklahoma Historical Society Photograph Collection, OHS). Named for Pres. Abraham Lincoln, Lincoln County is located in the east-central part of Oklahoma, bordered on the north by Payne County and on the south by Pottawatomie County. Creek and Okfuskee counties are to the east and Logan and Oklahoma counties border on the west. Interstate 44, the Turner Turnpike, crosses diagonally, east to west, through the county. The Deep Fork of the Canadian River drains the county, which has 965.62 square miles of total land and water area. The Cross Timbers and the agricultural lands of the Sandstone Hills in the east and the Red Bed Plains in the west dominate the county's topography and vegetation. In 2010 the incorporated towns included Agra, Carney, Davenport, Fallis, Kendrick, Meeker, Prague, Sparks, Stroud, Tryon, Warwick, Wellston, and Chandler (the county seat). Lincoln County is located in a region that has been little studied by archaeologists. However, a 1983 published archaeological survey reported that the county has sixty-six known sites, of which only three had been tested. In 1803 the United States purchased from France the area known as the Louisiana Purchase. In 1832 Washington Irving, Charles J. Latrobe, and Count Albert de Pourtalès accompanied Henry L. Ellsworth and others on an expedition in Indian Territory that may have passed through the far northwestern corner of the future Lincoln County. From the time of white contact to the late-nineteenth-century land runs, the county was the residence of several American Indian tribes. The Osage hunted on the land until they relinquished their rights in an 1825 treaty. The federal government then assigned the territory to the Creeks and Seminoles, until they surrendered the lands that encompassed Lincoln County in the Reconstruction Treaties of 1866. Ultimately, the Sac and Fox, Potawatomi, Kickapoo, and Iowa tribes settled in the area. Established in 1870 in the eastern part of the present county, the Sac and Fox Agency was the first settlement in the region and a major outpost for law enforcement, education, religion, and government administration. Athlete Jim Thorpe attended school at the site for a brief time. In 1880 near present Wellston, in the western part of the county, Christian T. Wells established Wellston Trading Post, the first white settlement. In 1890 the Jerome Commission (also known as the Cherokee Commission) negotiated an individual allotment agreement with the American Indians in the area except the Kickapoo. This made available land to be opened by run into an area that would include County A, later Lincoln County. The run occurred on September 22, 1891, when approximately twenty thousand people lined up to claim 6,097 homesteads. 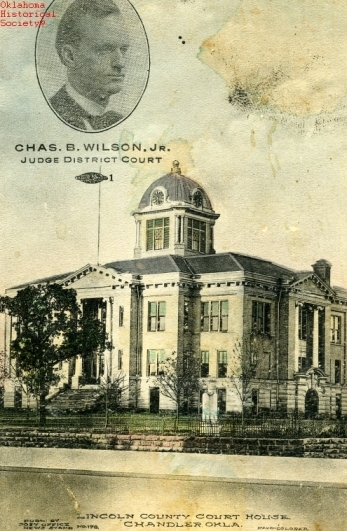 Because the town site of the county seat had not been surveyed, a separate run was held for Chandler on September 28, 1891. In May 1895, after the Kickapoo gave up their tribal claims, Lincoln County was rounded out in the last run in Oklahoma history. County A was accorded its name in a plebiscite of the residents soon after the first land runs. The name Lincoln won over Sac and Fox and Springer by 43 percent of the vote. For most of its history the Lincoln County economy has been based on agriculture. The soil, thin and prone to erosion, was probably more fit for grazing than cotton growing, but cotton almost immediately became the dominant crop after white settlement. During the first decade of the twentieth century Lincoln County was one of the top two counties producing cotton in Oklahoma. However, by the 1930s sixty-five-thousand to seventy-thousand acres of land lay abandoned. By the end of the Great Depression the economy had become more diversified. Oil furnished one-third of county tax revenue, and cattle raising and pecan growing became important income sources. In 1997, 1,916 farms involved 431,368 acres under cultivation. Transportation facilities have been crucial to the area's economy. In the late 1860s the West Shawnee Trail furnished a path for cattle drives to move through the center of the county (approximately along the route of State Highway 18) until the drovers opted for the Chisholm Trail further to the west. Beginning in 1898 the St. Louis and Oklahoma City Railroad (later St. Louis and San Francisco Railway) facilitated getting produce to market. The Atchison, Topeka and Santa Fe Railway and the Missouri, Kansas and Texas Railway came later. U.S. Highway 66 (Route 66) ran through the heart of the county and generally followed the course of the former Ozark Trail. Interstate 44 has provided a major national transportation artery since the 1950s. A number of prominent Oklahomans have been Lincoln County residents. Oklahoma governors James Brooks Ayers Robertson came from Chandler, and Roy J. Turner was born in Kendrick. Composer Roy Harris was born near Chandler. Baseball Hall of Fame pitcher Carl Hubbell called Meeker his home for many years, and Bo Belcher developed a baseball camp in Chandler. Chandler was also home to Pathé newsreel cameraman Benny Kent. The Doolin gang and outlaw Henry Starr operated in the county in the late nineteenth and early twentieth centuries. William M. "Bill" Tilghman served as sheriff in 1900 and 1902. The county's population stood at 27,007 in 1900 and peaked in 1907 at 37,293. It declined to 33,406 in 1920, and 29,529 in1940, reaching a low of 18,783 in 1960. Then it rose to 26,601 in 1980 and to 29,216 in 1990. At the turn of the twenty-first century Lincoln County had 32,080 residents. The census of 2010 reported 34,273, with 85.9 percent white, 6.5 percent American Indian, 1.8 percent African American, and 0.2 percent Asian. Hispanic ethnicity was identified as 2.4 percent. Chandler was the most populated town in the county. The county's economy was based primarily on professional services, small businesses, and service industries. Annual events included the Sac and Fox Powwow in Stroud and the Kolache Festival in Prague. Helen B. Herring, "A History of Lincoln County" (M.A. thesis, University of Oklahoma, 1943). Lincoln County, Oklahoma History (Chandler, Okla.: Lincoln County Historical Society, 1988). "Lincoln County," Vertical File, Research Division, Oklahoma Historical Society, Oklahoma City. Russell Wilford Lynch, Czech Farmers in Oklahoma: A Comparative Study of the Stability of a Czech Farm Group in Lincoln County, Oklahoma, and the Factors Relating to Its Stability, Bulletin, Oklahoma Agricultural and Mechanical College, Vol. 39 (Stillwater, Okla.: Oklahoma A&M College, 1942). Hobert D. Ragland, "Some Firsts in Lincoln County," The Chronicles of Oklahoma 29 (Winter 1951–52). Hobert D. Ragland Collection, Research Division, Oklahoma Historical Society, Oklahoma City. William H. Mullins, "Lincoln County," The Encyclopedia of Oklahoma History and Culture, https://www.okhistory.org/publications/enc/entry.php?entry=LI006.